I created ronrecord.com in May of 1994 when my employer, the Santa Cruz Operation, found out I had added a bunch of personal web pages to the SCO Skunkware website I maintained for them. I had created Skunkware for SCO as a way to add and integrate hundreds of open source projects into the company’s Unix based operating system distributions. I didn’t know any better so I also added a bunch of fun stuff like a Simpson’s icon set, Unabomber Haikus, and a whole lot more that was floating around on the emergent net. I also carved out a whole area of the Skunkware website for myself. Nobody noticed for a couple of years but eventually I was told to remove all my personal stuff from the corporate website along with the Simpsons images, Unabomber haikus, and so on. I complied. And thus was born ronrecord.com hosted by Cruzio, a locally owned mom & pop ISP run by my friends and former co-workers Chris and Peggy Neklason. I manually created hundreds of HTML documents using vi, the Unix visual editor. This screen-oriented text editor was originally created for the Unix operating system by the co-founder of Sun Microsystems, Bill Joy, and initially released in 1976. I still use one of the clones of vi, Vim (“Vi IMproved”), released in 1991. That is some long lasting excellent software. 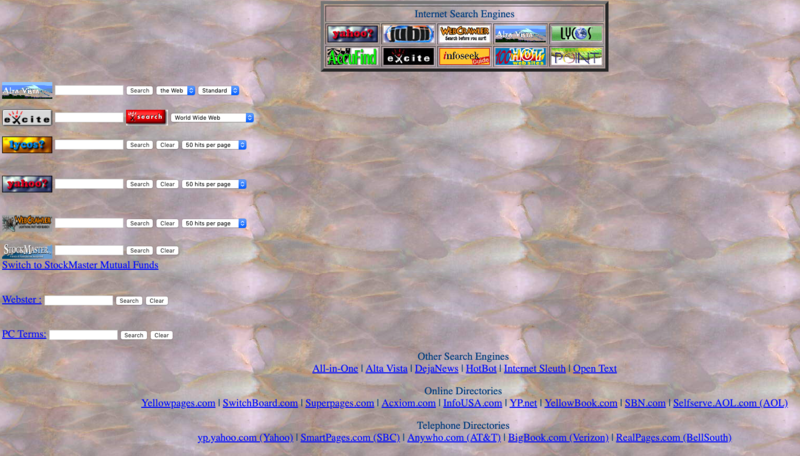 I’ve archived this early website as https://archive.ronrecord.com and it remains largely as it was back in the 90s. I’m particularly fond of the Search page I wrote back then which has search forms for Alta Vista, Excite, Lycos, and more. You’ll probably quickly note that it’s not designed well for cell phones or tablets, not “responsive”. In my defense, smart phones were rare outside Japan throughout the 90s, the BlackBerry was initially released in 1999 but didn’t rise to popularity in the U.S. until the mid-2000s. Also, style sheets (CSS) had not yet really come into play. All we had was HTML and vi. Copyright © 2019 Ron Record Websites. Theme: Zakra By ThemeGrill.